(1) Could be calibrate the Insulation monitoring devices or portable ground-finder online or offline. (2) The device has positive ground, negative ground and two ground test. (3) The device has voltage accuracy and voltage limit alarm. (4) Device with a built-in test process, provide the five groups preset, the user can set the combination. (5) The device has the function of simulating AC fleeing into DC fault test. (6) The device has the function of balance bridge detection. (7) The device has the function of system resistive capacitance and branch resistive capacitance. (8) The device has the signal analysis function. (9) The device can simulate parasitic loop faults. (1) DC power output range:0-260V,accuracy:≤±0.2%，capacity：±1.2A. (2) simulating AC fleeing into DC voltage range:AC220v,AC50v. 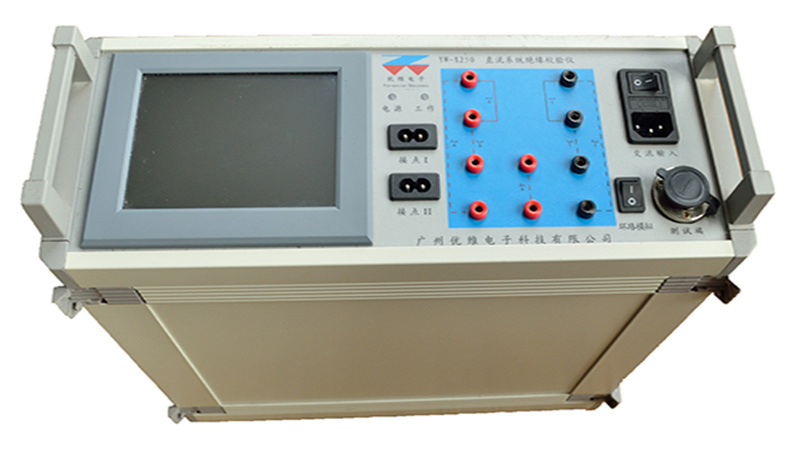 (3) DC voltage measurement range:0―300V,resolution:0.1V,accuracy：±0.1%. (4) Positive and negative Insulation to ground adjustment range:0-256KΩ，Adjust the step size：1kΩ. (5) Branch positive and negative ground distributed capacitance adjustment range:0-16uF,Adjust the step size：1uF. (6) system positive and negative ground distributed capacitance adjustment range:0-256uF,Adjust the step size：1uF. (7) Can select the number of test points:1-5,Test time interval:5-999s. (8) LCD size:5.6inch of TFT,resolution:65536 color,640*480.